A lovely large blooming hyacinth I grew on water. It’s scents wafts all around our house. It is so wonderful how on flower can set the atmosphere all on its own. This was the first year I experimented with hyacinths on water. I learned a lot about how to do it, and of course on how not to do it too! Turns out forcing bulbs inside is really easy. First I had three…. It all started out like this back in November. 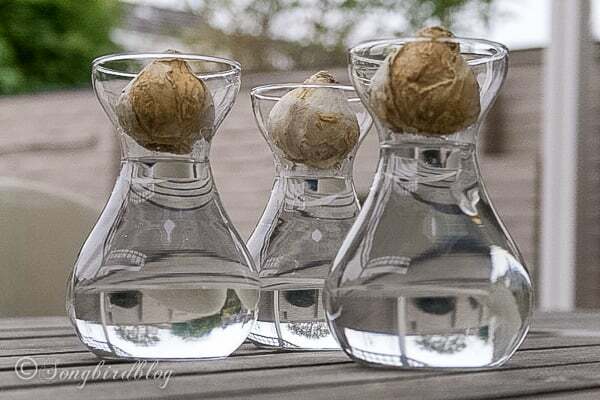 Three hyacinth bulbs on hyacinth vases. Just ordinary bulbs that you could choose to plant in your garden, but I decided to try something new. Just fill the vases up until just below the bulbs. Then put them somewhere dark and cool, because the bulbs need a rest period before they will bloom. I put them in our basement, and then forgot about them. Bad idea because the water evaporated just a little bit and that’s why one of my bulbs didn’t grow roots. Next time I will check them more often and refill the water on time. Lesson learned. So then I had two…. This picture is actually taken a few days too late. Early February I brought my hyacinths into the light and the warmth. 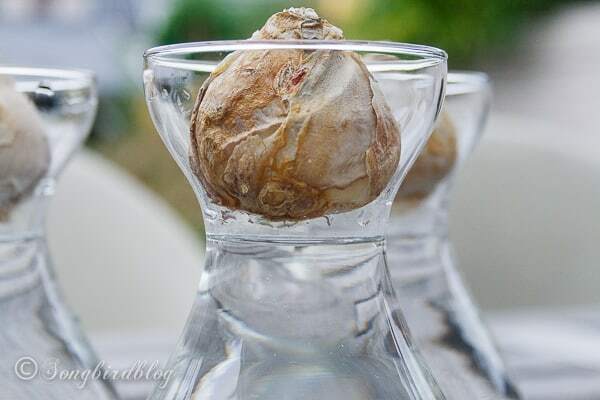 The bulbs had grown roots into the water and a tiny light green sprout was growing out of the bulb. Within a few days that green sprout shot right up in the air and the flower became visible. The growth strength in these babies is amazing, you could almost watch it grow by the hour. I moved the bulbs to a cooler spot near a north window so I could enjoy them longer. Sadly one of the bulbs started to fade even before the bloom had fully developed. So now there is one… One glorious hyacinth. And in the end that is all it takes. One hyacinth and Spring has entered the house. I am loving it. Happy early Spring to you! I have never tried this. And I must! Marianne, you may have ended up with one, but it is a glorious one. my son did one of these a few years ago in a water bottle with the top cut off and turned upside down and stuck back down into the bottle. the bulb sat right in there and grew roots into the bottom part of the bottle and we had a glorious fragrant bloom! but i was never able to reproduce it the next year! thanks for the great tips! just visiting from a to z.
they are beautiful! I wish I could do this. Beautiful… I need to try that… next year. Thanks for the how-to, Marianne. Zie nu…een heerlijke voorbode van de lente. En prachtig die sneeuw witte worteltjes….. The flowers are so lovely!! I am sooo looking forward to spring too! Those are so lovely and special. They are always such a welcome sight after a long cold winter. just gorgeous. i have always LOVED "forced bulbs" this time of year for obvious reason, but the bulbs on water is so magical looking. i've never seen it done like this before. Hyacinths are one of the most fragrant flowers. I adore the fragrance. Your forced bulbs look beautiful. I learned to do this as a child in 4H and have filled my home with forced flowers every winter. We hebben ook al wat bolletjes in huis gehaald. Heerlijk! Gelukkig schijnt het zonnetje de laatste tijd veel, kunnen we net doen alsof…. Hopelijk wordt het snel wat warmer. I LOVE this!! I want to try it next year!! So is November the best time to start them? and do you need to keep the water level just below the bulb?